Hi We have a gilt framed and glazed original copy announceing the death , Franklin.D. Roosevelt's War department Washington 25 D.C. as issued to all Army Chiefs of Staff 13 April 1945 from G C Marshall .Chief of staff. The certificate is in 3 parts & runs to over 300 words. If you can help Mike & Sheila with information on this item please click the comment button. Thanks! The writing posted on the bottom of the print matting (it is not hand written...printed and pasted on) reads:"This is the sketch made by Guzton Borglum when he started his famous sculpture-"The Lonely Lincoln" He gave it to me and I have had it is produced for those friends who also believe 'That this nation, under God, shall have a new birth of freedom" Christmas, 1941 Missy Maloney. The way this is worded confuses me. I'm not sure whether it's the original print or one of Missy Maloney's reproductions. My guess is that it is an original...just judging the best I can by the wording and the quality of the print itself. There is quite a bit of foxing on the front, but not so much on Lincoln himself (mainly around him). The print has been taped onto the matte from the back and the entire back of the print is very discolored (evenly). 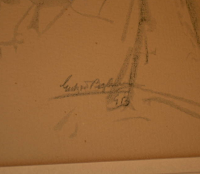 I would like to have this professionally restored and framed, but I want to make sure that it's worth it and that I get the right people to do it if it is. If anyone can give me any information about this piece I would greatly appreciate it. I am also unsure as to who Missy Maloney is. IF you can help Kyle with an idea of the value of this item please click on the comment button. Submitted by Chuck: My mom has passed along to me an item my late grandmother had in her possession. It appears to be an original receipt or promissory note from Thomas Jefferson’s estate. 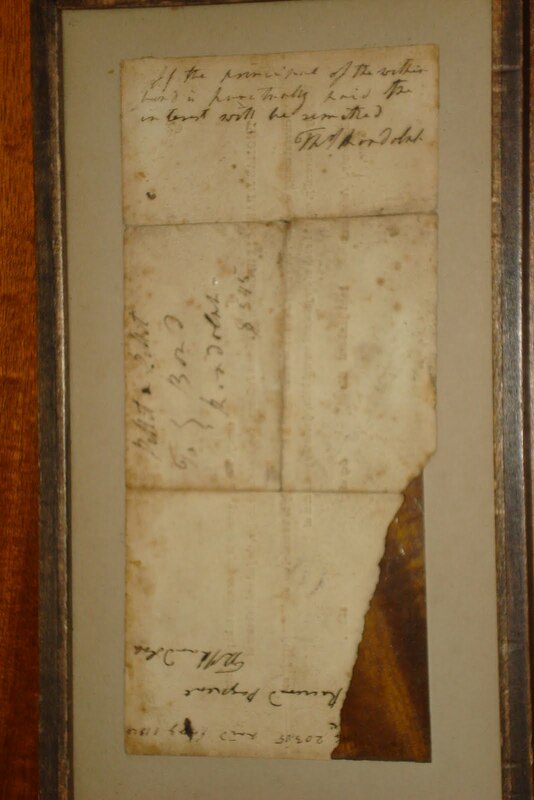 It is signed by Thomas Jefferson Randolph, the executor and it is in a frame that says “for the sale of one of Thomas Jefferson’s slaves.” Unfortunately, it does have a tear in the lower left hand corner where one would normally expect a signature. 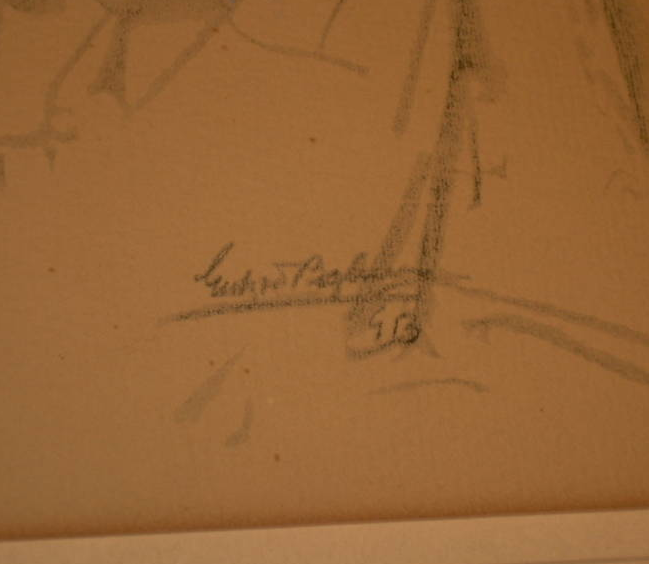 But Randolph signature appears on the reverse, where you would normally expect an endorsement.Also it says “for sale of a slave” on the frame, as you can see, but I see nothing on the note itself giving evidence of that. If you can help Chuck identify and value this item he would appreciate it. Simply click on the comment button above. While relic hunting a Confederate camp with a friend at my private farm in Virginia, we unearthed the pewter plate shown in the image attached. The plate measures 2.25" wide x 1.75" high and bears an eagle with banner against the American flag and contains the words "Buchanan," "Breckenridge," "LIBERTY," and "THE CONSTITUTION," all of which are reversed out. We suspect this is a printing plate especially after running a Wikipedia search on "Buchanan" and seeing a picture of a campaign ribbon that shows the image on our plate unreversed (a picture of this ribbon is also attached). When viewing the attached pic, please note we've made no attempt to clean this item for fear of damaging the pewter surface. If you can help David by identifying this item or offering an appraisal, please click on the comment button. Thanks! "Vote for Ike" written by Mack Gordon sung by The Democrats for Eisenhower made available by Hollywood Democrats for Eisenhower.These were in a house built in the 1950's and owner previously by a family who kept EVERYTHING. One record is in exceptionally pristine condition, but the others were in a box and did get dusty. Sharon is interested in donating these to a library in Texas and is looking for someone to help her estimate its value. If you can help, please click on the comment button. My husband and I bought his grandfathers home and we recently went into the attic and found the two items I have attatched to this email. Could you please find out the worth of these items. The size of the framed photo is 22.5 inches by 18.5 inches and the button type photo is 9 inches. If you can help Annette value these items please click on the comments button. I wrote a previous e-mail about my McGovern/Eagleton/Shriver knives. I also have another item. 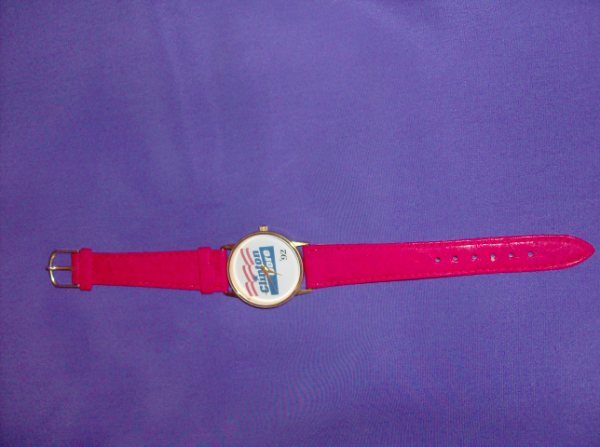 It is a watch that says on the face Clinton Gore '92. The band is red leather. I assume it works, as it has never been worn or wound. If you can help Elizabeth with an estimate of value she would appreciate it. Just click on the comments button. I was wondering if I could attempt to get an estimate on AppraisalBuddy.com for a couple of pieces of political memorabilia that I have. The items are two knives from the 1972 election. Both knives are for McGovern. 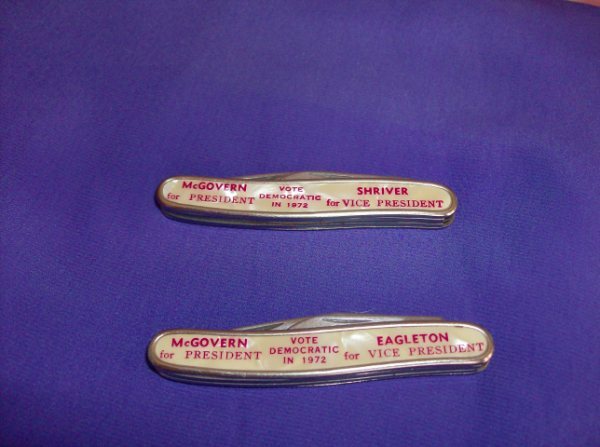 One says "McGovern for President" and "Shriver for Vice President" on the front; the other says "McGovern for President" and "Eagleton for Vice President" on the front (with Vote Democratic in 1972 in between the names on both knives). The backs both say "Vote Democratic '72" and both have a small caricature of McGovern, but on one the other small caricature is Shriver, and on the other it is Eagleton. Both knives are in good condition, and both have two blades. The Shriver knife is near perfect; the Eagleton knife has a small amount of rust on the top back side of the larger blade and a little down the side molding. If you can help elizabeth with a value please click on the comment button.